« Denae Is Excited To Announce That She’ll Be Attending MAD MONSTER Phoenix (Saturday Only)!! Hi everyone, we are totally excited about attending Phoenix Comicon again this year!! Make sure you come by and say “Hi” to us! Our table # is 14120! Here are the show hours for this year. Thursday 4pm-9pm, Friday 10am-7pm, Saturday 10am-7pm and Sunday 10am-6pm. Denae will be selling her Prints, Sketch Art Cards, Original Art, taking Commissions and doing a Raffle on her 11″x17″ Dr Who Original Art Piece of Martha Header (Freema Agyeman), the 10th Doctor (David Tennant), the 11th Doctor (Matt Smith) and Clara (Jenna-Louise Coleman) at the event. This will be everyone’s last chance to buy your raffle tickets. Denae will be doing the drawing at the end of this month and contacting the Lucky Winner! If the Winner of the Original Art Piece needs us to ship it to them, that won’t be a problem!! Shipping is on us!! Note: Raffle tickets for the Dr Who Original Art Piece will be $2 each or 6 for $10. If you’re NOT attending Phoenix Comicon this weekend, you can still enter the Raffle by sending your money via paypal to dfstudios@cox.net (as a gift payment). Please make sure in the notes that you include a way for us to contact you to receive your raffle number entry(s). 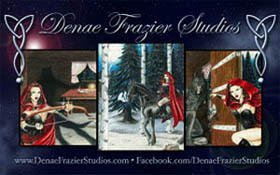 Below are some of Denae’s 2.5”x3.5” Sketch Art Cards (ACEO’s) that she will have available to purchase at our table. Enjoy and we look forward to seeing and visiting with you all this weekend! This entry was posted in appearances, art, events, news and tagged 10th Doctor, 11th Doctor, ACEO, Art Prints, Barrel, Black Cat, Christmas Jack, Clara, Colored Pencils, Copic Markers, David Tennant, disney, Doctor Who, Dr Who, Freema Agyeman, Jack Skelllington, Jenna-Louise Coleman, Lock, Martha Header, Marvel, Matt Smith, Mayor, Oogie Boogie, Original Art, Phoenix Comicon, Phoenix Convention Center, Prints, Raffle, Sally, Shock, Sketch Art Cards, Spider-Man, The Nightmare Before Christmas, Traditional Art, Wonder Woman, Zero. Bookmark the permalink. Trackbacks are closed, but you can post a comment.